The Jes will be going for an historic three in-a-row as they got the better of Marist College Athlone after an epic battle yesterday afternoon at Dangan playing fields. A Rory O’Flynn try seven minutes from time was the decisive score for the defending champions in the rearranged Connacht Schools Senior Cup semi-final. The tie had looked set for extra time after Marist fought back to level matters in the second half thanks to a brace from John Why after first half scores from Thomas Power and Gary Keane had given the Galway school the advantage. The Jes coach Bernie Ward admitted after the contest that he was relieved to come out on the right side of the result. "I think we made hard work of it at times but the boys worked very hard. I thought we had some good scores but we gave them too much ball and turned over too much ball. We have a few workons for the final but it is great to be in the final." The Jes went into the game as firm favourites having won all their pool games but it was the visitors who made the livelier start when flyhalf Michael Byrne bisected the uprights on three minutes after The Jes were pinged for coming in at the side. Forde's conversion cannoned off the posts to leave the scores at 8-3 to The Jes after 10 minutes. The Jes continued to dominate, and after strong ball carrying from No 8 Hugh Keaveney and inside centre Jack Power created a strong attacking position in Marist's 22, prop Gary Keane sneaked over to hand The Jes a 10 point lead after 24 minutes. However, the Jes failed to kick-on and after a Byrne penalty narrowed the gap to seven, only desperate defence kept the visitors at bay until the halftime whistle. The warnings of Marist's attacking prowess were not heeded by the Galway school and they were punished as John Why went over for his first score in the 38th minute after a bullocking run from openside flanker Mathias O'Neill. Fortunately for The Jes, Byrne's radar was off target with the conversion. Forde extended the home side's advantage out to five again with a penalty but Marist levelled when Why got over in the corner after more brilliant work by O'Neill in the 56th minute. The visitors began to grow in confidence and only brilliant scramble defence kept The Jes' try line intact. 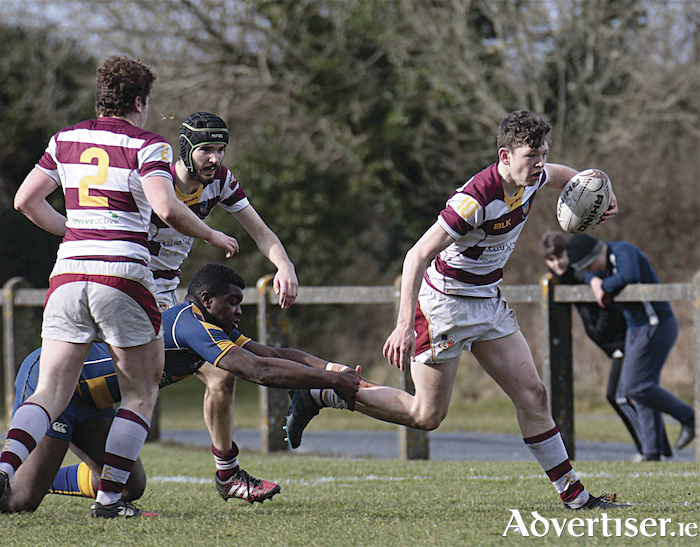 But a crucial interception from right wing Conor Briscoe enabled the Galway school to lift the siege and set up a counter attack where Rory O'Flynn danced his way through the visitors' defence to the try line and the final on March 20.